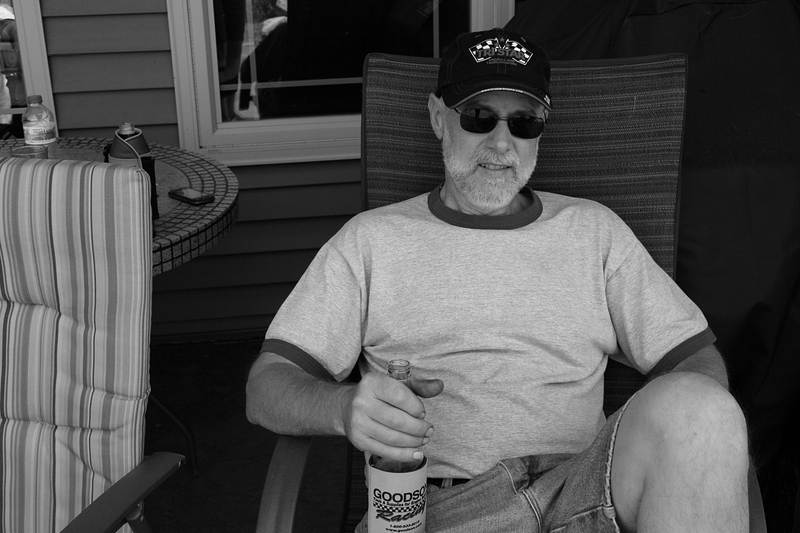 Randy relaxes at a family gathering in 2012. Thirty-three years ago today, I married this man. Randy. We have been through a lot together. Good times and challenging ones. Laughter and sorrow. Days that have tested our strength and days we want to remember always for their joyfulness. This is life. I am immeasurably blessed to journey through my days with Randy beside me. He makes me laugh, even when I don’t feel like laughing. Occasionally he’ll clip a fitting cartoon and post it on the refrigerator. And when I notice it, I smile, because he thought of me. Each spring he pulls a jackknife from his pocket and snips an armful of lilacs to set on our dining room table. That bouquet holds more meaning than a dozen roses. 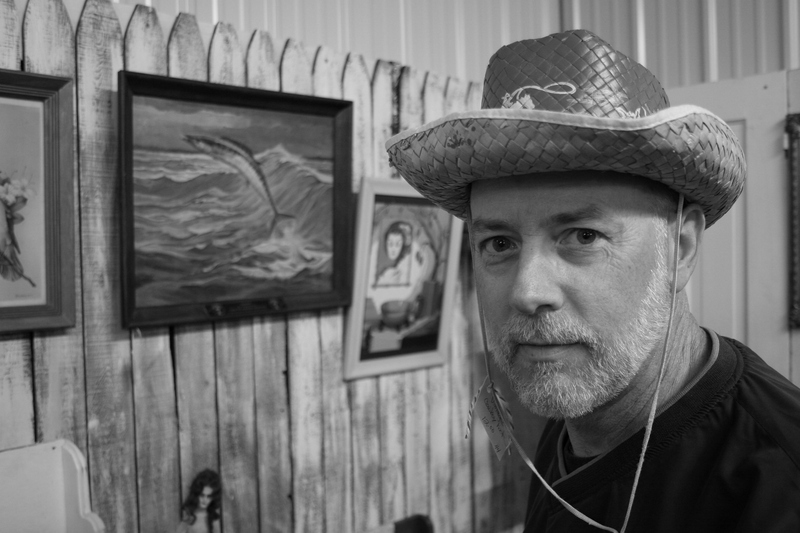 Modeling a vintage straw cowboy hat, like those we wore as children, in a North Mankato antique shop several years ago. He is light-hearted to my serious nature, calm to my storm, even-keeled to my sometimes emotional reactions. A balance. Not always perfect, because we are human, but a difference in personalities that works for us. He works hard. Grease rims his fingernails from his job as an automotive machinist. His work is always in demand. He is good at what he does. Really good. I tell him he works too hard. Last summer he cut back on the overtime and no longer works Saturdays. I am thankful. He deserves more than one day a week off from work. 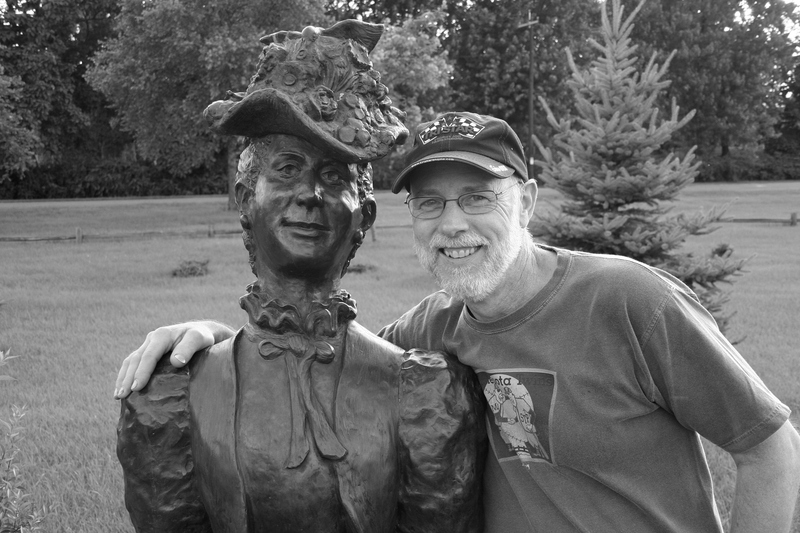 Randy obliges my request to pose with a sculpture in a Prairie du Chien, Wisconsin, park we toured while vacationing. Because of him, I’ve learned to appreciate vintage cars and, because of me, he’s learned to appreciate poetry. He is my greatest cheerleader, encouraging me in my writing and photography and even recently telling me he had an idea for a poem. “Roadkill,” he said. And then we laughed. To laugh with this man, to worship and pray with this man, to remember all the Sunday afternoons Randy sprawled on the living room floor reading comics to our children or playing Monopoly with them reminds me all over again of why I love him. He is quiet and caring and strong and loyal. A man of faith. And I love him. Always. Happy anniversary! He’s a lucky guy! Thank you and so sweet of you to say that. Thank you, Mike. I’ll check out your new blog. Thanks for directing me there. How lovely. He is also lucky to have you Audrey, your a gem. Ah, Dee, thank you. And I feel the same about you. Now Audrey this Minnesota face posting is just another one of your brillant and quite perceptive ideas. As I have said many times over you always find the everyday things in life to write about and photograph. So what better place to start out at is your very own home and wonderful husband. Lovely tribute to his endearing qualities. I’d like to add one of my own to your list as he is always up for your weekend jaunts around the coutryside 🙂 gathering material for your wonderful posts. Thank you, Sue. Yes, we enjoy our jaunts and just returned this afternoon from a get-away…to Iowa. Yes. We are only beginning to discover the gems in our neighbor to the south. This time we headed to Clear Lake. I have lots of blog material. But mostly, it was a wonderful close two-day escape with my husband. Congratulations hope you have a great anniversary and weekend. Thank you Missy. We did. We just returned from a short overnight trip to Clear Lake, Iowa. Nicely done, Audrey! That’s what best friends are about… and it is a blessing to live a real love story, isn’t it? Well, now, here’s an anniversary to Randy which I am pretty sure he will cherish for life. Just beautiful, Audrey. Oh, and he’s pretty darn cute, too. Happy Anniversary. He has yet to read this post as we just returned from a short get-away. I even penned a “roadkill” poem for him. Congratulations! May you be blessed with many more years of love and laughter! Thank you, Laurie. Good to hear from you again. Happy Anniversary! You both chose wisely! Thank you, Don. And, yes, I do think we both chose widely. Thank you, my dearest Jackie. Yes, we went to Clear Lake, Iowa, and took the backroads coming home, driving through many interesting small towns. I have a camera full of photos and lots of blog posts coming from this trip. It was wonderful to have these two days away. We needed them. Thank you, Charlie. I hope Drew can soon have Saturdays off. It’s been a great change and I only wish Randy had stopped working Saturdays years ago. Life is too short to work all the time. A big hello to Randy!!! Love it. A wonderful tribute to Randy and your love for each other. Our prayers to you for many more Aniversary blessings. Thank you so much, Virgil. What a wonderful tribute -Congratulations! I’m so glad I saw this post! Lovely. Happy anniversary to you both and many, many more! I hope we can meet up again one of these days. Thank you, Gretchen. I love your wish of “many, many more.” That’s so southwestern Minnesotan. And, yes, would love to see you again, too.